Here, we describe a simulation platform for self-organized, membrane based chemical processing of families of combinatorially diverse entities. We have based our underlying simulation method on an extended form of dissipative particle dynamics (DPD). Dissipative particle dynamics provides a momentum conserving extension to Brownian Dynamics allowing Langevin type mesoscale simulation with proper preservation of the hydrodynamic limit. Hydrodynamic effects already play an important role at molecular scales, and their proper treatment is important to attain the correct scaling properties in multiscale simulations. While DPD operates with point particles with central forces (which may be "covalently" linked to form more complex entities) it turns out to be more efficient to allow the interacting entities to have at least an orientation given by a dipole (or higher order multipolar). 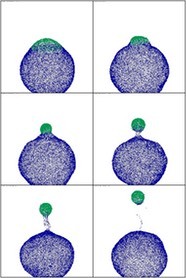 The dipole vector can be viewed as the surface normal, so that surface self-assembling particles can be characterized in direct relation to the structures they form. In fact mprDPD particles can form a rich variety of amphiphile structures such as micelles, vesicles, multilaminar sheets and nanotubes. Another important extension of DPD which we employ is to use density dependent interactions. Multipolar reaction DPD further extends traditional DPD by adding stochastic reaction kinetics to the particles, allowing it to function as a structural extension to stochastic reaction diffusion modelling, and a mesoscale alternative to reactive molecular dynamics. The method has primarily been developed by BioMIP within the Hepatosys project framework, in a consortium led by Prof. M. Zerial.